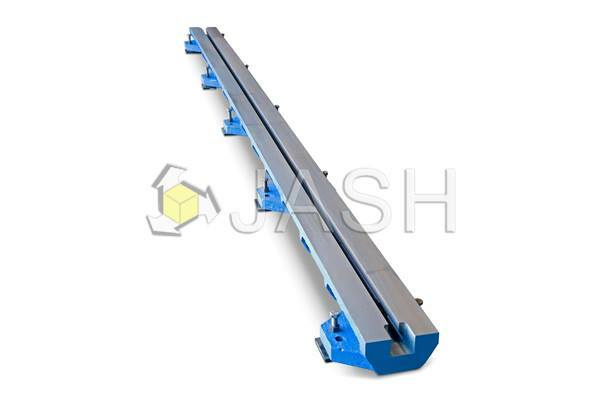 JASH Floor Clamping Rails or Fitter Bars or Floor Skids as commonly known, have a very wide range of uses. 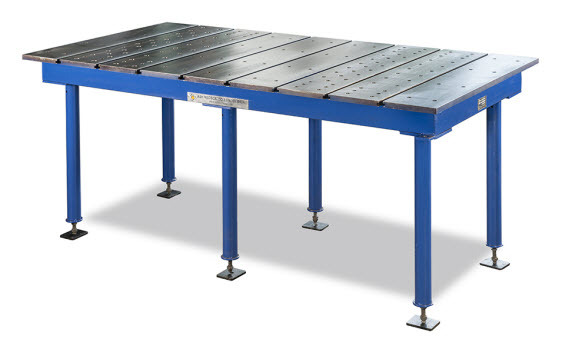 These rails placed in line and rows to the required pitch, for example 500mm (or as per customer’s requirement) apart, provide economical solutions for large planes with T-slotted Floor area for assembly, fabrication and testing of large components / machines etc. These are permanently grouted in concrete floors. Made from close grained plain cast iron to minimum Grade - FG: 200 - IS: 210 having hardness within 160-220 HB. Also offered in higher grades of casting upon request. Top working surface planed / milled machine finish. Normally provided with single machined clamping type fixing T-slots sizes 28, 36 or 42 mm conforming to IS:2013 having H12 tolerance. Flatness accuracies for individual rail are offered within 0.05 mm per meter length. Supplied with suitable arrangement for leveling and anchoring on the floor. Standard sizes / dimensions as per table hereunder. Rails with multiple T-slots & customer specific requirements, can also be offered upon request from buyer.